Get Free Santa Video eCard for children and grown ups! Get started by clicking “Start Here”. This is also available on mobile devices, too! 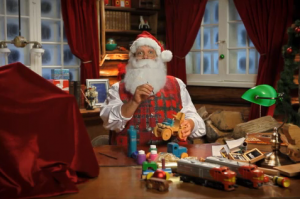 Share Christmas joy with Santa Claus and his magic machine. Fill out the magical form about the recipient and Santa will send back a nice personalized video.